Coohom is a cloud-based 3D modeling software powered by one of the most robust and fastest engines in the market. It enables you to transform your 3D models into a full-fledged room or home designs. The process is even easy and intuitive, as you can simply drag-and-drop elements across the working space. Additionally, Coohom enables you to render up to 4K quality. As a result, you can make lifelike models to show your colleagues and clients. You can even download or export your renders in JPG or PDF formats to make sharing them easier. Moreover, Coohom is designed specifically for the cloud. That is why it makes your work accessible from any browser and device. Apart from that, it has a native iPad app that enables you to enjoy its full functionality while you are ambulatory. Coohom is equipped with one of the speediest render engines available in that market. Because of this, you can cut short your wait for the rendering of your images. This makes exterior and interior design easier as well since designers now have access to 3D architectural visualization tools that are easy to use. Thus, what used to take hours to complete can be accomplished in as fast as five minutes. As Coohom has support for 4K renders, which is the highest quality of image currently, you can create photorealistic designs. Thus, you can show engaging models to colleagues and clients that are close to reality. On top of that, renders generated by Coohom are cost-efficient, thereby letting you save money while enabling you to maintain a high level of quality and professionalism. Coohom is a one-stop platform for architecture and home living modeling and visualization. Its design tools use 3D models to speed up the process of creating high-quality renderings. As a cloud-based solution, users can benefit from an easy setup process, no complex infrastructure, and a low initial cost of investment. It has a free basic plan and pro plan that comes in a monthly subscription. Meanwhile, it also offers a merchant platform for enterprise users for managing products and creating 2D images and 3D models. The tool’s high-speed rendering, VR, AR technology, and online and offline (in-store) sale assistance capabilities give you great value and cut down costs. What Problems Will Coohom Solve? Before, product catalogs were physical and required manual photographing of items like furniture arranged in a house, room, or studio to create the desired effect. It was an expensive enterprise that took plenty of time to complete. With Coohom’s merchants platform and 4K rendering capability, companies can save both time and money as they can show realistic scenes to customers of their newly released items and even of their old products. At times, designers find it difficult to translate their ideas into words, thus making it necessary for them to create concept boards and drawings. However, it is a time-consuming process that can result in the loss of clients. Coohom can resolve that problem with its high-speed rendering, VR and AR technology. That is because users can create layouts of rooms and arrange furniture and other elements with ease via the drag-and-drop function. 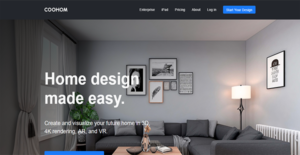 They can then show their designs in 3D view or in augmented or virtual reality mode, making them feel as if they are really inside a room or house. Selling products through a showroom is a challenging task, as not every customer can find their way to the physical store. With Coohom, businesses can open another stream of revenue, since they can market their products online. Using 3D modeling, store owners can build multi-dimensional models that can showcase the functionality and aesthetics of items. As such, entrepreneurs can attract more clients. If you are considering Coohom it might also be a good idea to check out other subcategories of Best Architecture Software collected in our database of B2B software reviews. Companies have diverse needs and requirements and no software solution can be ideal in such a scenario. It is useless to try to find an ideal off-the-shelf software app that fulfills all your business needs. The intelligent thing to do would be to customize the system for your special requirements, worker skill levels, finances, and other elements. For these reasons, do not hasten and invest in well-publicized leading solutions. Though these may be widely used, they may not be the best fit for your specific requirements. Do your groundwork, investigate each short-listed system in detail, read a few Coohom reviews, contact the seller for clarifications, and finally choose the product that offers what you need. How Much Does Coohom Cost? We realize that when you make a decision to buy Architecture Software it’s important not only to see how experts evaluate it in their reviews, but also to find out if the real people and companies that buy it are actually satisfied with the product. That’s why we’ve created our behavior-based Customer Satisfaction Algorithm™ that gathers customer reviews, comments and Coohom reviews across a wide range of social media sites. The data is then presented in an easy to digest form showing how many people had positive and negative experience with Coohom. With that information at hand you should be equipped to make an informed buying decision that you won’t regret. What are Coohom pricing details? What integrations are available for Coohom?